If you are using one of our 9 volt kits, it can be quite expensive renewing your alkaline batteries. Here is where the rechargeable 9v battery comes into play. 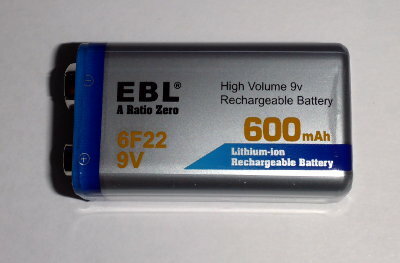 EBL manufactures Litium-ion 9v batteries that have a rating of 600mAh, now this is as high a rating, if not more, than your alkalines, and can be recharged around 1200 times. Low self discharge allows them to still maintain 75% of capacity even after 3 years of not using them, and you don't have to worry about the dreaded memory effect. EBL Model 6F22 is what you're looking for and also their charger. high capacity batteries we could find, we came up with the Panasonic eneloop. and after 5 years of storage, retain 70% of there charge. The AAA, rated for a minimum of 750mAh, still retain 70% after 10 years! that cost you in alkaline batteries? the normal eneloops will last. 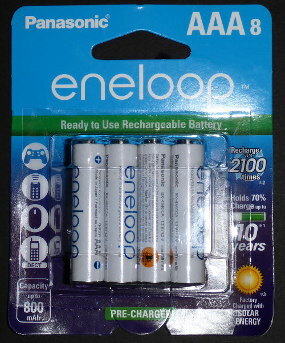 Normal eneloop AAA batteries run around $9.00 a four pack. 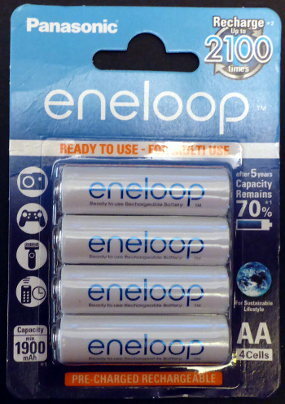 Normal eneloop AA batteries run around $13.00 a four pack. They get a little cheaper on ebay when you purchase in larger quantities. It's also advisable to purchase a Panasonic eneloop charger. for very long, and get weaker the more you charge them. but you will be able to reuse the eneloops for many years. due to the lower voltage. All other kits using AA and AAA work great.